All Bryan Singer films are deeply unsure of themselves: they attempt to marry several conflicting elements while never quite deciding what they want to be. Superman Returns can't decide whether it wants to be dark and moody like Batman Begins or a nostalgic throwback to the earlier films. Valkyrie flits between a romping B-movie about Tom Cruise blowing up Hitler and an intense character study about what it means to betray your country. And then there is The Usual Suspects, which claims to be the heist movie with the ultimate twist, but ends up as the ultimate disappointment. When making a genre film or any kind of homage, there is a very fine line between playing with conventions and coming across as completely unoriginal. The ingredients of a heist film are among the most familiar and formulaic in cinema: the assembly of a team, typically for one last job, the heist being planned and executed, and then something going horribly wrong. One of the tests of a good filmmaker is being able to take a very cliché-ridden subject and do something interesting and memorable while being fully mindful of generic constraints. There are two main ways to make a good heist film in the modern day. The first is to take a particular convention and break it. In The Ladykillers, the heist is barely planned and takes place off screen, with the majority of the film being focussed on the gang unravelling at the hands of Mrs. Wilberforce. The second is to use audience familiarity with conventions to one's advantage, using the heist as a springboard to explore something else. Inception may have a heist structure, but the actual crime which Cobb commits is only as important as the ideas surrounding it - the nature of dreaming, the fracturing of identity, the consequences of addiction and the pain of losing one's love. From a purely mechanical point of view, The Usual Suspects is a very well-made heist film. All the pieces of the plot fit together very well: there are no gaping holes in either Kevin Spacey's account or the various encounters which persuade Gabriel Byrne to come on board for the big job. And taken in abstract, the final twist is fairly impressive. It's not a million miles away from the silly ending of Shattered, but it's carried with suitable grace and doesn't feel like an unnecessary contrivance, crowbarred in to bring the film to a speedy conclusion. But here, already, we have the central problem with the film. The Usual Suspects may be mechanically sound, but it is so obsessed with being mechanically sound that it never allows you to bond with what is going on in the meantime. Singer spends so much time and effort ensuring that we go through the motions in the slickest way possible, that the actual characters become increasingly superfluous. By keeping the characters at arms' length from the plot, a barrier between the story and the audience is created. Whenever the screenplay attempts to invoke ideas about the nature of evil, or fear, or the power of will, these ideas are quickly passed over or shot down as the film demands to keep pressing forward. Potentially fascinating explorations of the nature of underground crime are suppressed in favour of the next irrelevant plot point, making The Usual Suspects a decidedly hollow experience. If we compare Singer's efforts to that of Quentin Tarantino in Reservoir Dogs, the significance of this problem becomes apparent. Like The Usual Suspects, Reservoir Dogs is a straightforward heist film whose distinctions are structural rather than aesthetic. But unlike Singer, Tarantino's work not only knew its place within a genre: it knew that the audience knew its place as well. By giving the audience a degree of certainty, Tarantino could get away with his outlandish dialogue and shuffled timeframes which would otherwise have thrown the audience a bigger curveball. To use the analogy of a circus, Reservoir Dogs is like a show at the big top in which everything happens as expected, but always with a flourish. Instead of just a trapeze act, we get a trapeze artist doing triple somersaults - and instead of gangsters simply talking about the heist, we get them to dissect the meaning of Madonna's 'Like A Virgin'. The Usual Suspects is like a circus show in which the ringmaster is so keen to hurry the acts along that we have no time to admire them, and all that is memorable is the huge poles holding up the tent. You only have to look at the characters to realise how much talent has been squandered here. The five 'usual suspects' are all quirkily drawn, whether in their dress sense, their accents or the way they conduct themselves within the group. Christopher McQuarrie's screenplay contains a number of potentially great scenes, laden with distinctively macho dialogue and criminal posturing. But the more time we spend in their company, the more you come to realise that they are quirky for its own sake: there is no narrative reason for Benicio Del Toro to speak like that. They are little more than archetypes in new suits, and like later Tarantino works, you are never convinced that any of them could really exist. Without properly three-dimensional or believable characters, or much direction beyond rigidly following a formula, the one thing that could have saved The Usual Suspects would have been some kind of moral clout. Both this film and Se7en are thrillers in which the villain is prominent, or at least has a prominent presence which hangs over everything that unfolds. But what made Se7en work, aside from David Fincher's distinctive visuals, was its ability to make subtle contemporary moral points while honouring an old-fashioned hardboiled storyline. 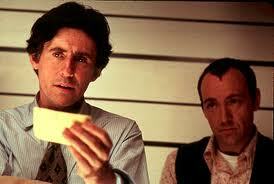 The Usual Suspects has the potential - that word again - to have this exact kind of moral clout. 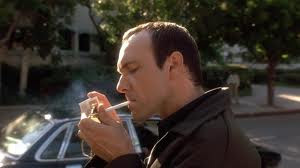 The character of Keyser Soze, a criminal who operates underground through oblivious associates, is an intriguing creation which carries meaning about the way that evil infiltrates society. 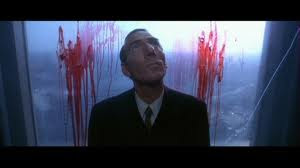 Kevin Spacey's long monologues contain references to the Devil and vengeance on a genuinely Biblical scale, painting Soze as a man that would make even Hannibal Lector flinch. But again, the film never allows these ideas to come out beyond brief suggestions - suggestions which are barely elaborated upon by either the story or the characters. In the midst of all this, The Usual Suspects deserves some credit for its execution. Singer is not a terrible director, at least not from a constructional point of view: his camerawork is solid and the heist scenes especially are well-shot by his long-time cinematographer, Newton Thomas Sigel. As far as the performances go, Kevin Spacey gives his all in the meatiest of roles; his performance of a man with cerebral palsy is Oscar-baiting but convincing. 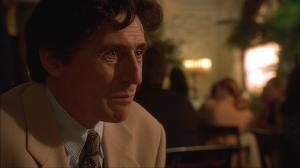 Gabriel Byrne remains an enjoyable screen presence, even if his choice of films is somewhat less enjoyable, and it remains the best thing that Stephen Baldwin has ever done. 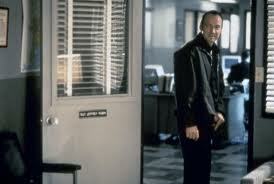 But in all, The Usual Suspects is a densely plotted disappointment. Singer can never make up his mind what issues he wishes to explore within the confines of the story, and the result is a film which claims a lot but delivers on very little. Through the best efforts of the performers and the decent visuals, you find yourself wanting to like it more, and you start looking for something or someone with whom you can engage. But for all your best efforts the film never lets you in, making The Usual Suspects little more than a well-made waste of time.